NelsonHall, an industry analyst in human capital management and business process outsourcing (BPO), again named Zalaris a top provider its prestigious NelsonHall Evaluation & Assessment Tool (NEAT). The firm’s analysis centers on human capital management (HCM) services with emphasis on SAP SuccessFactors deployments. “This recognition is a tribute to the expertise of Zalaris’ SAP SuccessFactors team and our continued innovation with the industry’s best solutions,” says Zalaris’ CEO Hans-Petter Mellerud. 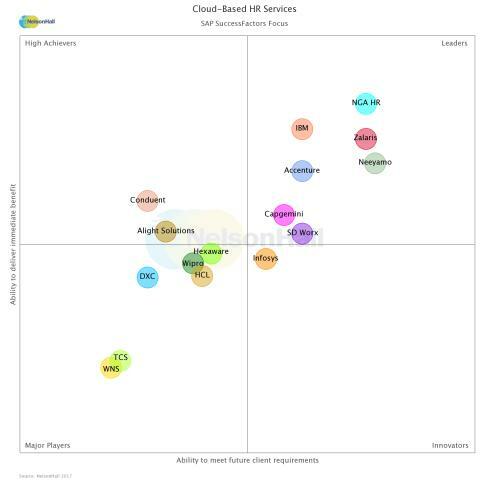 NelsonHall’s 2017 report further advanced Zalaris in its position within the leadership quadrant of their NEAT matrix (pictured below), which covers 17 vendors offering cloud HR services based on SAP SuccessFactors. The matrix plots each company’s ability to deliver immediate benefit to clients in relation to the depth to meet future requirements. Zalaris ranked among the highest in relation to the overall criteria. The NEAT findings are well supported by key features in Zalaris’ markets. The Cloud segment is constantly growing in importance and in Q2/17 Cloud represented almost 15 per cent of the company’s revenues. “We are now in a position to support new and existing clients in existing and new markets, accelerating their critical HR transformation with SuccessFactors based end-to-end fully digitized people processes driving efficient business execution and in compliance with GDPR requirements.” Mellerud states. Zalaris supports clients in a broad range of industries, accelerating their critical HR transformations toward the data-driven culture of the future – all based on SAP SuccessFactors. Acting as a single point of contact from designing efficient people processes, implementation and integration to post-implementation support. “Customers want the assurance that their HR Outsourcing and Human Capital Management partners can provide immediate benefit as well as confidence to grow in new cloud directions as needs change,” Mellerud says. At the end of 2016, Zalaris became the first SAP BPO partner for SAP SuccessFactors Human Capital Management (HCM) Suite across Europe, Middle East & Africa (EMEA) and Middle and Eastern Europe (MEE) regions. Already a large SAP Gold Partner for this industry-leading, hosted, audited and cloud-based multi-tenant HCM suite, Zalaris also supports SAP HANA. This in-memory computing platform enables customers to accelerate HR processes, drive more intelligence with HR analytics and simplify corresponding IT and HCM operations. The company’s cloud-based multi process HR outsourcing offering includes cloudHR / Talent management suite, full mobile access, employee data management/HR administration; payroll processing, time and attendance, travel expense processing, pension administration, benefits administration, sick leave and compensation administration, and HR analytics as a service. HR and IT personnel will gather on 27th March this SAP User Group event is being held at SAP UK headquarters. This is the place to be for everyone that desires better business results by implementing the most effective performance management tools. As well as sponsoring the event, Zalaris will share HR insight together with SAP and an existing Performance & Goals customer, Plan International.